They’re the generation the media can’t stop talking about. They’re shaping taste, marketing campaigns and the power structure of America. They’re millennials, young adults who are often children of the celebrated baby boom generation. While much of the hype around the millennial generation is dedicated to youth culture, they’ve grown into adulthood and are dealing with issues not normally associated with younger generations. Among those issues are hair loss and thinning hair. At RHRLI, we’re experts on all things related to hair loss, and we deal with patients of all ages and backgrounds. So we want to examine the thoughts and attitudes of some of our youngest patients. We offer a permanent solution for hair loss. It’s called the ARTAS® System, and it uses precision robotics to perform hair transplant that will give you a natural, healthy looking head of hair. There’s no standard definition as to what constitutes a millennial. Unlike baby boomers who are almost universally defined as being born between 1946 and 1964, millennials belong to a generation with no clearly defined parameters. Most observers tend to place the beginning of the millennial generation in the early to mid-1980s and the end point in the early 2000s. According to the Atlantic, researchers Neil Howe and William Strauss placed millennials between 1982 and 2004. While there’s some uncertainty as to who was born into the millennial generation there’s been research that shows they already care a great deal about aging. A study by the research firm Mintel shows that nearly 3 in 5 millennials or 57 percent are afraid of aging, according to Marketing Daily. Sixty percent of millennials said they were doing all they can to fight the physical signs of aging, while 62 percent said they were doing all they can to fight the mental signs of aging. There’s anecdotal evidence that millennials appear to be worrying about hair loss. “Millennial hair loss is something that I’m seeing quite a bit of in my practice,” said Dr. Candace Thornton-Spann, a Nevada-based dermatologist told ABC News. 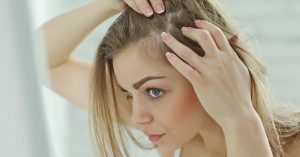 Dr. Spann says she sees no evidence that hair loss is more common among the millennials than prior generations and she attributes the early visits to intense curiosity on the part of her younger patients. “In this generation, there is no taboo, there is only the drive to seek answers and I think that’s probably what’s driving the increase in numbers that we’re seeing,” she said. Some of the hair loss Dr. Spann is seeing is attributed to issues such as stress or diet restrictions that cause patients to lack enough protein in their diets. Studies have also shown that millennials use hair care products more often than previous generations, according to the website CosmeticsDesign-Europe.com. This may account for millennials losing hair due to overuse of chemicals. There are many conditions that lead to hair loss and thinning hair and not all of them are necessarily associated with aging. If you’re seeking a permanent solution to hair loss RHRLI can help. We’re the only hair loss treatment center on Long Island that has the ARTAS® System. It’s non-invasive and virtually pain-free. Contact RHRLI today.